When Pride of America sails this weekend, it will have room for a few more passengers than it did last week. Thirty-two new staterooms and suites have been completed which were started during the vessel’s March dry dock. Work has been continuing since, as the ship sailed in Hawaii. CND subscribers also read about Port Promotions ceasing operations ... and meeting the ship. Carnival Cruise Lines today revived one of their best selling tools for first-time or new-to-Carnival customers, people who may be a little unsure of the whole idea of going on a Carnival cruise. They brought back their satisfaction guarantee, with a couple of changes. CND subscribers also read about the new "guy" on the Culinary Council ... and an option not on the shore excursion menu. Several industry publications are confirming rumors that Lisa Bauer, Royal Caribbean International's EVP of global sales and marketing and revenue management, will be leaving the company by the end of the week. Her departure seems to be tied to approximately 100 other lower level job cuts designed to improve efficiency. All major cruise lines ceased calling at Mazatlan during the 2010-2011 winter season when violence on the city’s streets reached such a high level that it was feared a cruise passenger was sooner or later going to be involved. Now three cruise lines have put the port back on their schedules after intense lobbying by the city. But is it now any safer? CND subscribers also read about the date being set for Costa Concordia to roll ... and Royal Caribbean is increasing their dividend. MIAMI, Sept. 11, 2013 -- Royal Caribbean Cruises Ltd. (NYSE, OSE: RCL) today announced that its board of directors had named its first lead director, approved a plan to replace staggered terms for directors with annual election, and more than doubled the quarterly dividend on its common shares. The moves, which were approved unanimously at the board's September 11th meeting, reflect the board's continuing efforts to enhance its corporate governance structure and drive long-term value creation for its shareholders. The board elected William L. Kimsey as its lead director. Mr. Kimsey, who is the former chief executive officer of Ernst & Young Global, Ltd., has served on the board since 2003 and is Chairman of the company's Audit Committee. Mr. Kimsey also serves on the board of directors of Accenture PLC and Western Digital Corporation. As lead director, he will be the liaison between the board's non-management members and Chairman and Chief Executive Officer Richard D. Fain. He will preside at meetings of the non-management directors, will advise and approve the content and scheduling of board meetings and discussions, and will be available for discussion with major shareholders. Said Fain: "I'm delighted that Bill Kimsey has agreed to become our lead director. He's been a consistent source of wise counsel, and his voice will be even more important as we move forward." Said Kimsey: "I am pleased by the steps our board has taken to further enhance our corporate governance, and I look forward to working with my fellow directors and management to improve shareholder value." The board of directors also adopted changes to its bylaws as a result of which candidates elected to the board will serve one-year terms, and will stand for re-election annually thereafter, effective with the slate of directors to be elected at the company's 2014 annual meeting. This implements a proposal adopted by shareholders at the company's May 2013 annual meeting. Today's actions demonstrate the company's commitment to continuous improvement in its corporate governance practices following the 2011 termination of the Shareholders' Agreement between Royal Caribbean's two largest shareholders, AWilhelmsen & Co and Cruise Associates. Under that agreement, the two groups exercised effective control of the company, with key decisions - including the selection of directors, the choice of top management, and the approval of major capital expenditures - made at the discretion of the two shareholders. "The board's decisions affirm our focus on robust corporate governance. These steps are a sensible progression forward from our earlier governance structure," said Tom Pritzker, chairman of the company's nominating and corporate governance committee. The board also approved an increase of the quarterly cash dividend to $0.25 per common share, payable October 8, 2013 to shareholders of record September 24, 2013. This represents an exceptional jump, more than doubling the previous $0.12 per common share dividend level. Said Fain: "Dividends are an increasingly important component of total shareholder return. This dividend increase was made possible by our profitability improvement program and our improving financial position. It reflects our confidence in our ability to grow our investment returns into the future, given strengthening results and modest capacity growth." Royal Caribbean Cruises Ltd. (NYSE, OSE: RCL) is a global cruise vacation company that owns Royal Caribbean International, Celebrity Cruises, Pullmantur, Azamara Club Cruises and CDF Croisieres de France, as well as TUI Cruises through a 50 percent joint venture. Together, these six brands operate a combined total of 41 ships with an additional six under construction contracts. They operate diverse itineraries around the world that call on approximately 455 destinations on all seven continents. Additional information can be found on www.royalcaribbean.com, www.celebritycruises.com, www.pullmantur.es, www.azamaraclubcruises.com, www.cdfcroisieresdefrance.com or www.rclinvestor.com. Certain statements in this release relating to, among other things, our future performance constitute forward-looking statements under the Private Securities Litigation Reform Act of 1995. These statements include, but are not limited to, statements regarding expected financial results and the costs and yields expected in future periods. Words such as "anticipate," "believe," "could," "estimate," "expect," "goal," "intend," "may," "plan," "project," "seek," "should," "will," and similar expressions are intended to identify these forward-looking statements. Forward-looking statements reflect management's current expectations, are inherently uncertain and are subject to risks, uncertainties and other factors, which could cause our actual results, performance or achievements to differ materially from the future results, performance or achievements expressed or implied in those forward-looking statements. Examples of these risks, uncertainties and other factors include, but are not limited to the following: the impact of the economic environment on the demand for cruises, the impact of the economic environment on our ability to generate cash flows from operations or obtain new borrowings from the credit or capital markets in amounts sufficient to satisfy our capital expenditures, debt repayments and other financing needs, the uncertainties of conducting business internationally and expanding into new markets, changes in operating and financing costs, vacation industry competition and changes in industry capacity and overcapacity, emergency ship repairs, including the related lost revenue, the impact of ship delivery delays, ship cancellations or ship construction price increases, financial difficulties encountered by shipyards or their subcontractors and incidents or adverse publicity concerning the cruise vacation industry and the unavailability or cost of air service. More information about factors that could affect our operating results is included under the captions "Risk Factors" and "Management's Discussion and Analysis of Financial Condition and Results of Operations" in our most recent annual report on Form 10-K and subsequent quarterly reports on Form 10-Q, copies of which may be obtained by visiting our Investor Relations web site at www.rclinvestor.com or the SEC's web site at www.sec.gov. Undue reliance should not be placed on the forward-looking statements in this release, which are based on information available to us on the date hereof. We undertake no obligation to publicly update or revise any forward-looking statements, whether as a result of new information, future events or otherwise. Silversea announced their eighth ship - and third expedition ship - today. The intimate ship will allow the line to expand their expedition voyages in the remote areas of Micronesia, Melanesia, Polynesia in addition to the Russian Far East, Southeast Asia, New Zealand and Australia, with a special emphasis on the Kimberley in Australia. The 5,218-ton ship will be named Silver Discoverer. It is the former Clipper Odyssey, and it will undergo extensive refurbishment before it is rechristened in Singapore on February 24, 2014. Once again, Norwegian Cruise Line is asking their customers to help them name their next two ships, but this time we notice two things they are doing differently. Holland America has an interesting concept on a couple of ships. One evening of the cruise, they take the Pinnacle Grill, their premium alternative restaurant, and convert it to something of a branch of a world-renowned restaurant with whom they’ve partnered. One of those restaurants is Holland’s De Librije, operated by Dutch chef Jonnie Boer. He is a Michelin Three-Star Chef and a member of HAL’s Culinary Council. 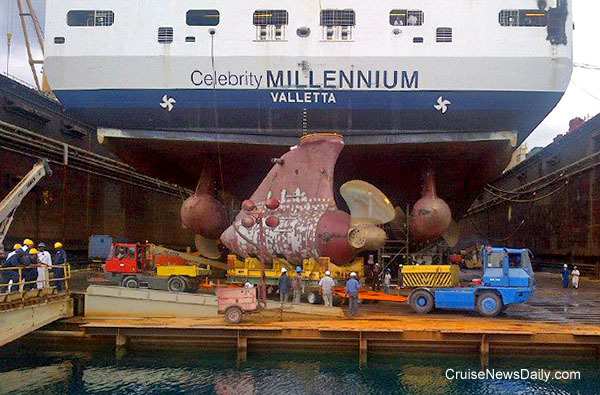 CND subscribers also read about Celebrity Millennium reaching dry dock (more) ... a long-range medevac ... and the hot spot for cruise lines. Celebrity Millennium arrived at the Grand Bahama Shipyard in Freeport Friday evening (September 6, 2013). 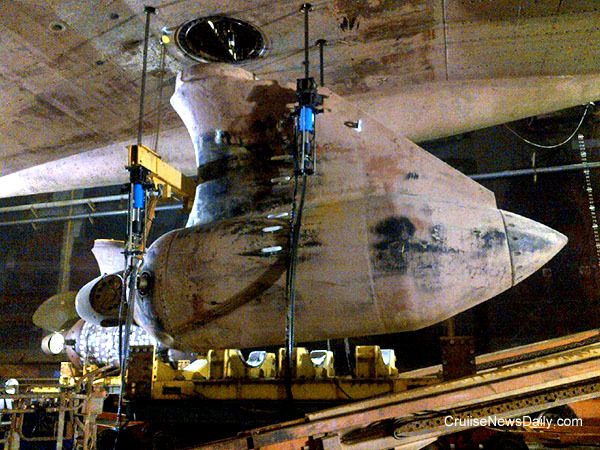 Work began immediately to replace the failed starboard propulsion pod. The damaged pod, shown above just after it was detached from the ship, was responsible for the early termination of two cruises and the cancellation of four other voyages. The ship then had to be deadheaded from Ketchikan to Freeport, and it will have to be deadheaded back to San Diego for the September 22 cruise. 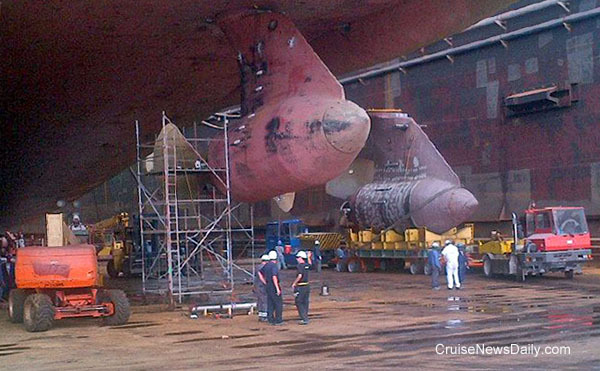 The 250-ton new pod, which arrived via chartered a cargo vessel from Europe, is seen being trucked into the dry dock behind Celebrity Millennium before the old pod was detached. The new pod is seen above moved into position next to the old pod (foreground) as it was ready to be detached. Photos courtesy for Celebrity Cruises.